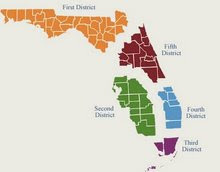 DOES ARTICLE IX, SECTION 1(A), FLORIDA CONSTITUTION, SET FORTH JUDICIALLY ASCERTAINABLE STANDARDS THAT CAN BE USED TO DETERMINE THE ADEQUACY, EFFICIENCY, SAFETY, SECURITY, AND HIGH QUALITY OF PUBLIC EDUCATION ON A STATEWIDE BASIS, SO AS TO PERMIT A COURT TO DECIDE CLAIMS FOR DECLARATORY JUDGMENT (AND SUPPLEMENTAL RELIEF) ALLEGING NONCOMPLIANCE WITH ARTICLE IX, SECTION 1(A) OF THE FLORIDA CONSTITUTION? Chief Judge Benton wrote the majority opinion which was joined by Judge Davis, Judge Van Nortwick, Judge Padovano, Judge Lewis, Judge Clark, and Judge Marstiller. Judge Wolf filed an opinion specially concurring with the majority opinion. Judge Roberts wrote a dissenting opinion which was joined by Judge Hawkes, Judge Thomas, Judge Wetherell, Judge Rowe, Judge Ray, and Judge Swanson. In the course of its 135 paragraphs, respondents’ amended complaint alleges a failure to make adequate provision “for a uniform, efficient, safe, secure, and high quality system of free public schools” by, e.g., providing insufficient funding for public education, shifting responsibility for educational funding to local governments, providing inadequate resources for teachers’ salaries in particular, and adopting a so-called accountability policy that is an obstacle to high quality. The amended complaint alleges that Florida’s public schools are not safe and secure, that graduation rates are too low, that student promotion and retention policies are ineffective, that results of achievement tests reveal various inadequacies, and much more. Petitioners moved to dismiss the amended complaint, relying on Coalition for Adequacy and Fairness in School Funding, Inc. v. Chiles, 680 So. 2d 400, 407 (Fla. 1996), for the proposition that the amended complaint raises only nonjusticiable “political” questions, see Baker v. Carr, 369 U.S. 186, 209 (1962), questionswhich the trial court—and, indeed, any court (according to the petitioners)—lacks jurisdiction to entertain. Rejecting petitioners’ argument that it lacked jurisdiction to decide any facet of any one of the respondents’ claims, the trial court denied the motion to dismiss. Because “‘In this state, circuit courts are superior courts of general jurisdiction, and nothing is intended to be outside their jurisdiction except that which clearly and specially appears so to be.’”.....The petitioners’ apprehension at the prospect of burdensome discovery demands unduly discounts the protections they and all litigants will enjoy because any discovery that may occur will take place under the supervision of the able trial judge, if and as needed. More fundamentally, the petitioners’ asserted concerns about discovery do not speak to the only issue that is germane in prohibition proceedings: the nature and extent of the lower tribunal’s jurisdiction. A court of general jurisdiction, the circuit court has statutory authority to entertain claims for declaratory judgment." [emphasis is mine]. In this case, the majority denied the writ of prohibition because "Prohibition lies to redress an inferior tribunal’s usurpation of jurisdiction, but it does not lie to prevent mere error in the exercise of the inferior tribunal’s jurisdiction.....Prohibition is unavailable to divest a lower tribunal of jurisdiction to hear and determine its own jurisdiction, or to test the correctness of a jurisdictional determination that depends on fact finding the lower tribunal is charged with making.....The writ is narrow in scope, is to be employed with great caution, and, our supreme court has even said, is to be utilized only in 'emergencies. '” [emphasis is mine]. That being said, the majority concluded "There is no emergency here." There is no emergency, according to the majority, because "the trial court has been asked to construe the Florida Constitution, not the constitution of any other state. But analogous questions have arisen under the constitutions of other states, and the majority rule is that educational adequacy provisions in state constitutions are judicially enforceable." This is a difficult case because it involves a clash of two extremely important precepts: the concept of separation of powers enumerated in article II, section 3 of the Florida Constitution, and the right of the people to have their will concerning the adequacy of the state’s education system, as expressed in an amendment to article IX, section 1 of the constitution, implemented....On the other hand, the Florida Constitution is a document of the people......The people’s will is expressed through the adoption of constitutional language. The difficult issue is when do the people have a right to enforce their will, as it is expressed in the constitution, through the court system. Judge Wolf concluded: "In the instant case, the allegations of the complaint, taken as true, indicate a clear failure of the Legislature over a reasonable period of time to assure the fundamental values identified within the amendment were being met. While the remedy suggested by this opinion was not specifically requested by the respondents, they did ask for any other 'relief the court deems proper.' In addition, the complaint requested the adoption of a “remedial plan . . . which includes necessary studies to determine what resources and standards are necessary to provide a high quality education to Florida students.' A request for implementing legislation is necessarily contained within these requests for relief." The dissent began: "In Coalition for Adequacy & Fairness in School Funding, Inc. v. Chiles, 680 So. 2d 400, 402 (Fla. 1996), the plaintiffs filed a complaint seeking declaratory relief challenging the funding of the state school system of K-12 education. They alleged that the funding and policies adopted by the legislature did not meet the requirements of article IX, section 1 of the Florida Constitution. They asked the trial court to declare that an adequate education was a fundamental right under the Constitution and that the state had failed to make adequate provision for a uniform system of free public schools as provided for in the Constitution. The trial court dismissed the complaint with prejudice finding that, to grant relief, it would have to usurp or intrude upon the appropriation power exclusively reserved to the legislature. The trial court also found that the complaint presented a non-justiciable political question. Id. On appeal, the Florida Supreme Court affirmed the trial court’s dismissal. Id. at 402, 408." Further, the respondents seek a declaration that would mandate a change in educational policy consistent with their policy views. In their amended complaint, they allege that the state’s current accountability policy is an obstacle to obtaining a high quality education. Education policy matters such as the state’s accountability policies involve thousands of interested persons, including parents, teachers, administrators, and locally elected officials. As in matters of appropriations, under our constitution’s strict separation of powers, only the legislature is properly equipped to balance the competing interests involved in education debates, in addition to other vitally important issues such as criminal justice, health care, economic and environmental regulation, and other matters. Thus, it is solely in the legislative branch that the constitutional values of an “efficient, safe, secure and high quality” school system can be constitutionally defined and implemented. In other words, this question is quintessentially political and thus not justiciable, and the writ of prohibition must issue as the trial court did not have jurisdiction to consider this question.....See generally, The Fla. Senate v. Fla. Public Employees Council 79, 784 So. 2d 404 (Fla. 2001). In Florida Senate, the court recognized that the judiciary has no power to encroach on the legislative process and stated that it is the “final product” of legislation that is subject to judicial review. Id. at 408. Here, however, the respondents seek a declaratory judgment to order the legislature to make policy and appropriation changes in futuro. Thus, while the respondents purport to challenge present appropriations and policies, their prayer for relief seeks to order the legislature to enact policies and increase appropriations, and such relief cannot be granted without interfering in internal legislative affairs, by necessity.